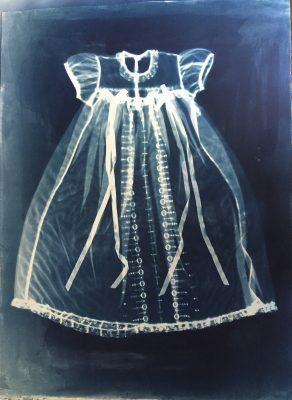 A cyanotype by Siobhan Byrns, a University of Lynchburg art professor, has been selected for a fine art exhibition curated by Sam Abell, an influential American photographer known best for his contributions to National Geographic. “What the Water Took From Us #1” will be on display in PHOTO ’16. It is part of a series of cyanotypes by LC art professor Siobhan Byrns. “What the Water Took from Us #1” will be on display in PHOTO ’16, a national exhibition at the Multiple Exposures Gallery in the Torpedo Factory Art Center from October 18 to November 27. LC alumni are invited to join Byrns for the artist reception at the gallery on October 29 from 2 to 4 p.m. During that reception, Abell will give a talk and present awards. Thousands of photos were considered for the exhibition, and only 35 were chosen. Most of the entries have a more photojournalistic style, making Byrns’ piece stand out as a fine art piece. “to be included with the photojournalists is an incredible honor,” she said. Winning this sign of approval from a photographer of Abell’s stature was an great surprise, too, Byrns added. A cyanotype is a photographic image made by using light to print an image onto a canvas laden with iron compounds. Byrns teaches the method in her advanced photography class at LC. She enjoys the physical, labor-intensive process of printing a cyanotype. “It feels more like you’re making a photograph instead of just taking a photograph,” Byrns said. Her cyanotype in the PHOTO ’16 exhibition is part of a series that depicts white clothing in a blue background that makes the objects appear to be floating in water. It was on exhibit in Connecticut before taking a spot in the National Juried Photography Exhibition at the Academy Center of the Arts in Lynchburg in September. Byrns thought of the series about a year ago. She was planning the baptism of her infant daughter when she learned about Abdullah Kurdi — a Syrian refugee whose wife and two sons drowned in the Mediterranean Sea as the family tried to reach Europe. She was saddened by the image of the man’s lifeless son lying on the beach in the same position in which her daughter was sleeping. She was struck by the juxtaposition of water’s role in life or death. Thinking about these contradictions, she began a series of cyanotypes. So far, three depict baptismal gowns and two show wedding dresses. The skeleton-like images convey both a hope and a sadness. “It really played with the idea that baptism takes away sin, but water also takes life,” she said. She hopes that the image and its message will help people ponder the plight of refugees who have left Syria and other war-torn countries. “It’s so easy for us to flip channels and not realize how much these people are risking to preserve their family and preserve life,” she said. Byrns’ work will go on display October 18. The Multiple Exposures Gallery is located in Studio 312 in the Torpedo Factory Art Center at 105 N. Union Street, Alexandria, Virginia. It is open from 11 a.m. to 5 p.m. each day, except Thursdays, when it is open from 2 p.m. to 8 p.m. on Thursdays.